France's Emmanuel Macron drew fire Monday after criticising an elderly "yellow vest" protester who was badly injured during a demonstration in Nice at the weekend.Macron has repeatedly been accused of lacking empathy and harbouring an arrogant, dismissive attitude towards ordinary people who complain about having difficulties making ends meet. Last year he told an unemployed gardener who complained about not finding work after sending out hundreds of applications that he only had to "cross the road" to find a job. He also told elderly citizens protesting over pension cuts that the French should moan less, and described people who took to the streets over his reforms to the labour code as "slackers". The target of his latest comments was Genevieve Legay, a 73-year-old anti-capitalism activist and grandmother, who suffered a fractured skull Saturday after riot police charged anti-government demonstrators in the Riviera city of Nice. Macron, who was in the area Sunday for a meeting with visiting Chinese President Xi Jinping, told the Nice-Matin newspaper that he wished Legay a "speedy recovery, and perhaps a degree of wisdom". "When one is fragile and risks being shoved, one does not go to places that are declared off-limits and one does not put oneself in a situation like that," he said. The remarks were immediately criticised by Legay's family, which has accused police of using excessive force to disperse the protesters and filed a legal complaint against the authorities. Nice prosecutor Jean-Michel Pretre, who is leading an investigation into the incident, said that initial inquiries indicated that Legay "was not touched by security forces" and that she claimed to be unaware the protest was forbidden, despite contradictory comments in a television interview. 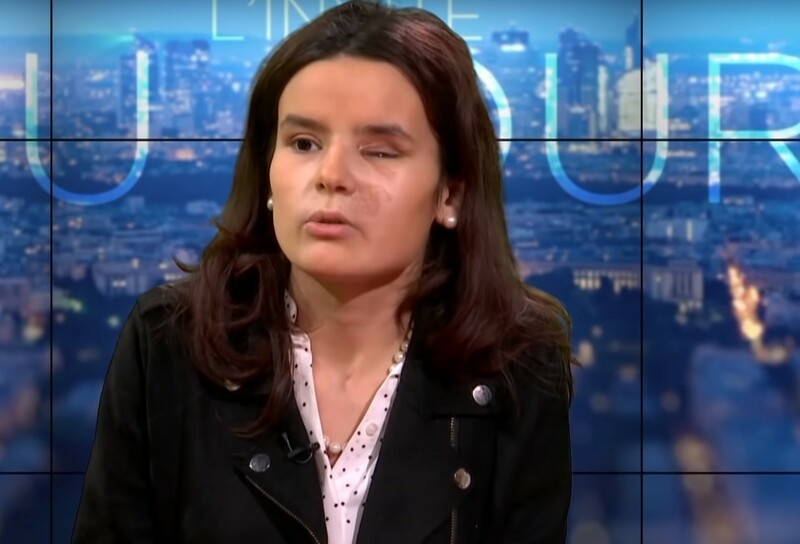 Her family's lawyer Arie Limi argued meanwhile that "you don't criticise someone who is on a hospital bed," and called Macron's remarks "crass and insensitive". The hard-left France Unbowed and far-right National Rally, which have been vying to tap support for the "yellow vests", also rounded on the president. "Mr Macron, our Genevieve of Nice does not need your lessons in wisdom. You could learn a lot from her. She stands up for the common good. And you, in the name of what are you hitting her?" France Unbowed's firebrand leader Jean-Luc Melenchon tweeted. National Rally spokesman Sebastien Chenu, for his part, said it was evidence that Macron "doesn't like the French". Gotta hand it to the French citizenry. +rep for staying on top of this. Last edited by shakey1; 03-26-2019 at 08:01 AM. The US MSM blackout is indefensible. This is the US/Western MSM that claims that Yellow Vests protests are becoming smaller and smaller if that were true their protests wouldn't had being this huge. I am pretty sure if there were any anti gov protests in Russia or Iran MSM would being claiming that the protests would be in the millions. The Pro Macron Propaganda is Strong in This Article. It seems many MSM journalists defend Macron and his gov for only one reason his a globalist and a Rothschild elitist. Last edited by AZJoe; 04-19-2019 at 01:27 PM. Yellow Vest protesters marched to the La Defense business park in Paris to denounce “the art of tax optimization,” keeping France’s weekend demonstrations alive amid a big police presence. 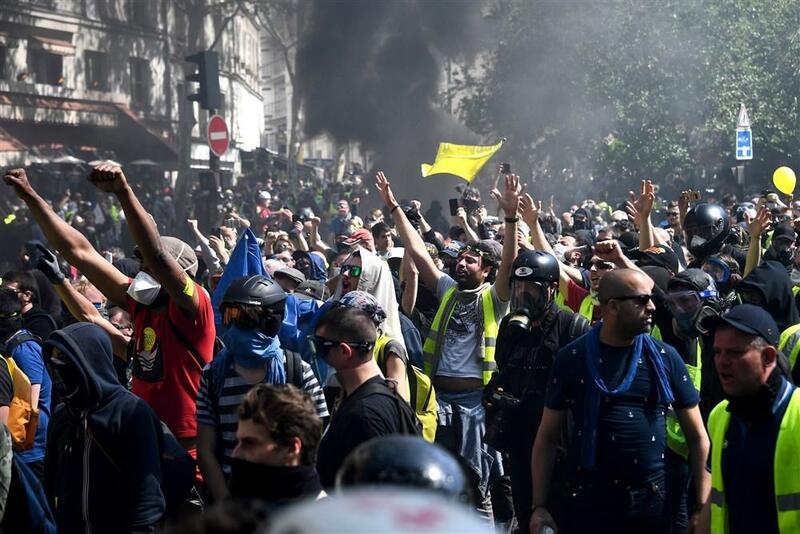 About 6,300 demonstrators nationwide, including 3,100 in Paris, were on the streets on Saturday afternoon, the 21st weekend in a row of protests, according to the Interior Ministry. That compared with 5,600 last week. 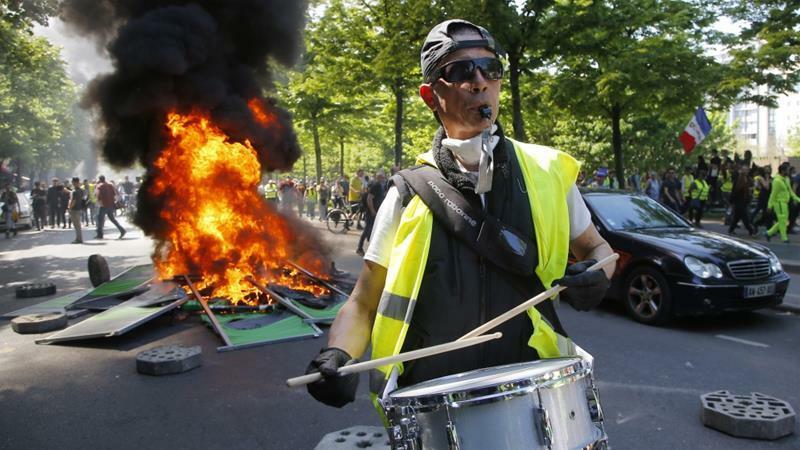 Large areas of Paris and several regional cities have been declared off limits to the protesters since an eruption of violence last month, when anarchists sacked and burned stores and restaurants on the Champs-Elysees boulevard. Scuffles broke out Saturday between police and protesters in Rouen, Agence France-Presse reported. Paris police searched more than 10,000 people at various locations as a preventive measure and arrested 28, AFP said. Mainstream News Media and their propaganda are pushing heavy agaisnt the protesters once again. Remember this the same Fake News MSM that claimied that Yellow Protesters numbers were about to brush off. AP news is pushing an propaganda article yet again. What sources they used? of course Interior Ministry and French Media. Mainstream News Media wants you the reader and viewer to pretend that there never was any protests in France and that everything is ok! Yellow Vests turn out almost 75,000 for protests. Government claims 22,000. If you read the Fake News Media, the Fake News Media are only citing the France goveremnent source of the protests numbers. I am sure the government estimates are very reliable as the so called Macron national debate. Which Macron himself already said he wont change anything. So what was the point of his National fake debate? saving his image. Anyone should know that the government numbers are a lie but even if they were true it is amazing that 22,000 people are still turning out after all this time. Many people will have had to tend to their real lives or have been scared away by the police brutality. Even the government numbers mean serious trouble and brewing rebellion. Sad. No respect for roads, no respect for businesses. Just chaos. These anarchists are probably of the anarcho-capitalist variety, since they're targeting businesses. Last edited by TheTexan; 04-08-2019 at 12:36 AM. Protesters aren't calling for just tax cuts they want his Rothschild face and mouth out of office. Macron so far is just further proving to the French people that his not a president that fights for the French people but rather the interest groups that put him into power at time when Obama was president for 8 years. These morons really thought that they could imploded the liberal polices so quick without any resistance from traditionalist Euporean Families. Macron's going to be fine long after nationalist-idiot Britain (soon England: sans Scotland, N. Ireland, and even Wales) is gone. It was an error to not veto the continued English dithering, but this Halloween deadline will surely (and must) be the last. Didn't see this covered in US MSM, that looks like a war zone. More clashes broke out on Saturday between Gilets Jaunes (Yellow Vest) protesters and French riot police during the 23rd straight week of protests across France. Police had arrested 137 protesters by 15:40 CEST (3:40 PM local time), according to Euro News. Authorities warned that they expected the protests to be more violent following the catastrophic fire at Notre-Dame Cathedral on Monday. Some demonstrators took issue with the approximately 1 billion euros ($1.12 billion) pledged so far to restore the landmark by some of the country's wealthiest families, including the owners of luxury groups LVMH and Kering, the Bettencourt family behind the L'Oreal beauty empire, and scores of companies such as BNP, Total, Société Générale and Sanofi, according to Euro News. Several demonstrators clearly alluded to the catastrophic fire at Notre-Dame cathedral on Monday, which prompted an outpouring of national sorrow and a rush by rich families and corporations to pledge around 1 billion euros ($1.12 billion) for its reconstruction. The police siad that "violent groups have formed in the procession," and asked that nonviolent Yellow Vests "disassociate yourself from these groups, let law enforcement and emergency services intervene." 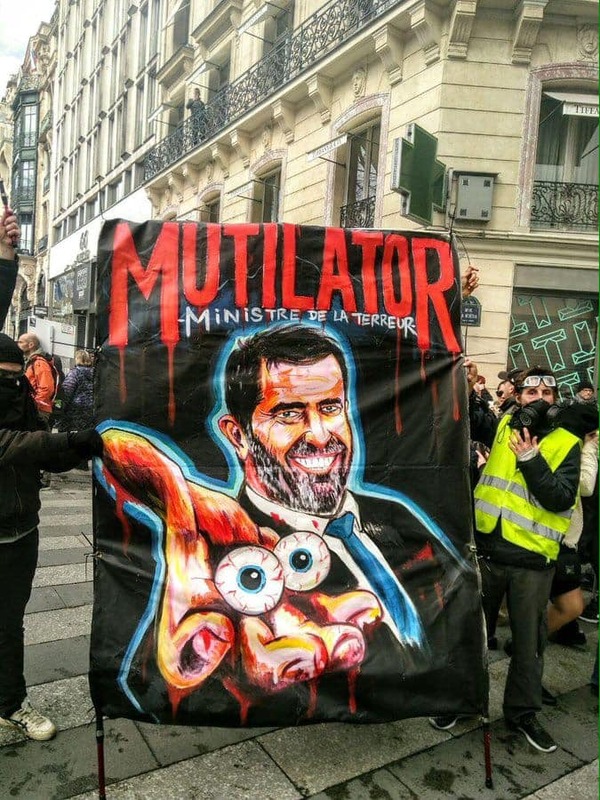 Talking to reporters on Friday, Interior Minister Christophe Castaner, said that intelligence services expected rioters to take to the streets in several cities including Toulouse, Montpellier and Bordeaux but "most particularly in Paris." 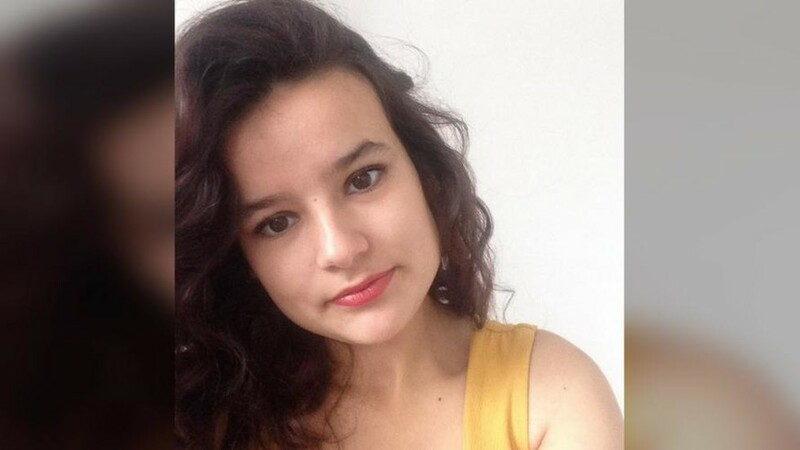 "The rioters have visibly not been moved by what happened at Notre-Dame," Castaner added, criticising the "polemic" and "the most absurd conspiracy theories" that surfaced following the blaze at Notre Dame Cathedral on Monday. He also condemned calls made on social media to protest near the ravaged monument. A security perimeter will remain around Notre-Dame until Monday, while some 60,000 police officers were deployed across the country.